If you're thinking of putting in a practical, functional outbuilding, here's some advice that will ensure that it will meet your needs now and for years to come. 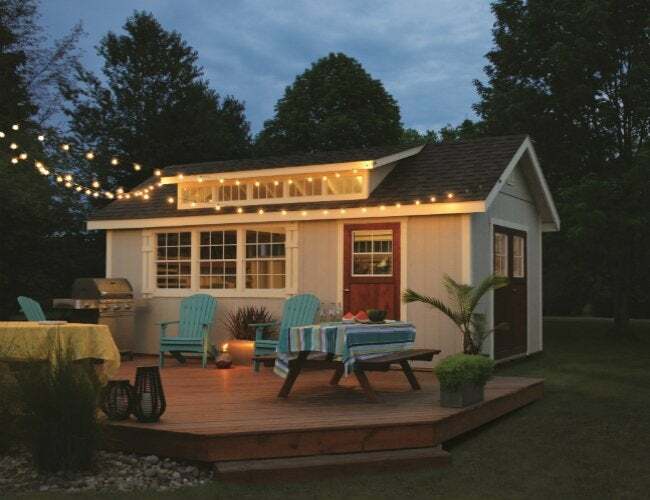 When you’re investing money and time in—and, for do-it-yourselfers, the energy to build!—a backyard shed, you’ll want to get things right from the start. The good news is that an outdoor structure offers a lot of potential for return on investment, and we don’t just mean when you’re ready to move out. An outdoor structure can serve as anything from a superior storage solution to a nearby getaway to a place for pursuing your passions—at least, if you make sure before you start that it will truly meet your needs. Consider the advice provided here by the LP® Outdoor Building Solutions® shed pros as you compose your list of “must-haves” and “must-dos,” and then move full speed ahead toward the perfect shed! 1. Pick the best place. Where you put your shed is key. To decide, think about how you intend to use it, and situate it in a spot convenient for that purpose. A potting shed, for instance, should be near the garden, while a child’s playhouse should be close enough to the patio or back door for you to keep an eye on it. You’ll also want your shed in an accessible, fairly open area—if it’s hidden behind bushes, you might forget it’s there and underutilize it! You’re always better off growing into a shed than growing out of it. 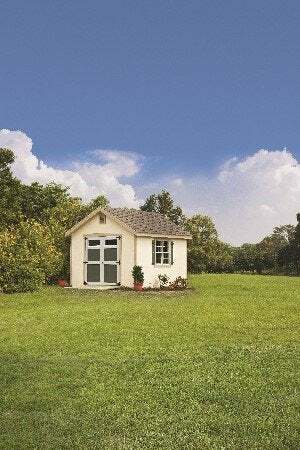 When calculating the appropriate size for your shed, consider what you’ll want to keep in it—for example, your riding mower or the family bicycles as well as other items you’ll want to use while inside, such as a table or desk. Be sure to factor yourself into the space: Will you be able to stand up, walk around, and work in it easily? For assistance, check out the LP Outdoor Building Solutions nifty size guide. For your outdoor structure to stand up to the elements, looking and performing great for years to come, ensure that it’s built of durable materials. LP® SmartSide® Siding, for instance, is treated with the proprietary SmartGuard® process to resist fungal decay and termites. The more comfortable you make your shed, the more time you’ll want to spend inside, so choose materials designed to increase your enjoyment. LP® ProStruct® Roof Sheathing with SilverTech® is engineered to make the interior of the shed brighter and help maintain cooler temperatures, while LP ProStruct Flooring with SmartFinish® provides a cleaner, more premium look free of knots and voids. 5. Make a grand entrance. When you think about the coming’s and going’s in your shed, you’ll realize that not just any door will do! Many people find that double doors and even a ramp make it much easier to get large items in and out. Double doors are also more inviting—an asset if you’ll be using the shed for entertaining. Windows you can open and close are a must if you intend to use the shed for a workshop, craft room, or office. You’ve got to have ventilation and light, and a nice view through the windows will make this outbuilding an even more attractive spot for work. Even if you plan to use your shed primarily for storage, you’ll find that windows will provide a breath of fresh air when you’re inside organizing or retrieving items. 7. Let there be light. A proper light source is vital if you’ll be working inside the shed, and electricity is clearly key if you plan on plugging anything in. But if wiring your shed proves too pricey, apply a little ingenuity! Solar panels on the roof or a portable generator could supply the required juice for work lamps. Once you have a few points of light in place, the reflective surface of SilverTech® roof sheathing can help amplify the illumination. Creating a path to your shed is a big plus. Not only will it make it easier to go back and forth when dew or rain leaves the ground soggy, the path will serve as a cohesive connector between shed and home. Use gravel, paving stones, bricks, slabs, or some combination to achieve a path that’s formal, rustic, or modern—whatever best suits your space. Want to make outdoor entertaining easier and more enjoyable? A deck addition to your shed is just the ticket. Folks can mix and mingle on the platform while you use the interior as a staging area to prepare food and drinks. A deck or porch is also fun and functional on a shed-turned-playhouse—little ones can use it as an extra play area or a stage to put on shows for the grown-ups! 10. Get creative with storage. Trick out the shed’s interior with storage that makes smart use of the small space. Consider all the vertical options, from shelves, hooks, or pegboard on the walls to a hanging shoe organizer for small tools to a magnetic strip that keeps metal items within easy reach. You needn’t spend a lot on storage either: Shelving units can be built out of wooden crates, and pallets (often available for free from local stores) can act as platforms to raise items off the floor. 11. Don’t forget the finishing touches. Finishing the inside of your shed with drywall will help insulate the space, and painting it your favorite color will surely add distinction. But don’t stop there! Complete your backyard retreat with a little decor, and you’ll want to visit, day or night, in every season. Inspired? Now see how durable and dependable LP products can help make your space so much better! This content has been brought to you by LP Outdoor Building Solutions. Its facts and opinions are those of BobVila.com.